Website development services provided by SynapseIndia cover every aspect of web design and development and use technologies like the CodeIgniter framework. The company is powered by a team of digital strategists, graphic designers, and software developers, who work in concert to deliver the best-in-class websites. SynapseIndia caters to a diverse group of clients, with its services spreading from real estate businesses to the entertainment industry. Web developers at SynapseIndia are well-aware about the elements of programming that make a website desirable and user-friendly. They always create a mobile-friendly design so that visitors using the mobile devices also get a superior online experience. Moreover, they understand the significance of interactive design while dealing with customers having mountainous expectations. Therefore, every website built by SynapseIndia features interactive experience. Other factors like accessibility to web content also play a crucial role in increasing traffic on the site. SynapseIndia implements cutting-edge content management solutions to meet those expectations. 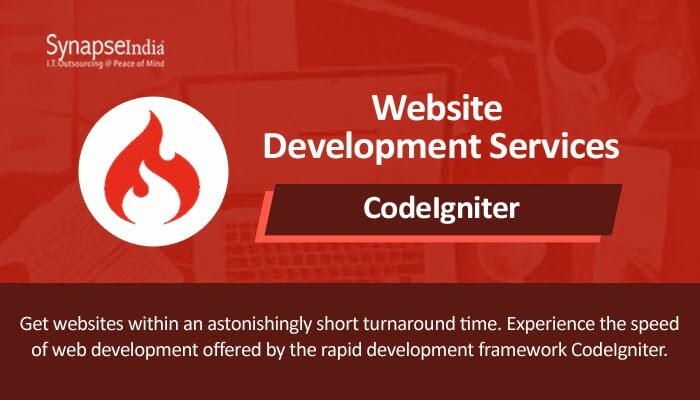 Additionally, the use of development platforms like CodeIgniter gives important advantages. CodeIgniter, for example, enables the developers to execute a rapid development process. So, clients can get their projects delivered within a remarkably short time span. Other technologies like Microsoft .NET a low the programmers to create a vast range of efficient functionality, like real-time communication between server and client. The end goal of the web development services remains the same: help clients maintain and grow market share through digital transformation.